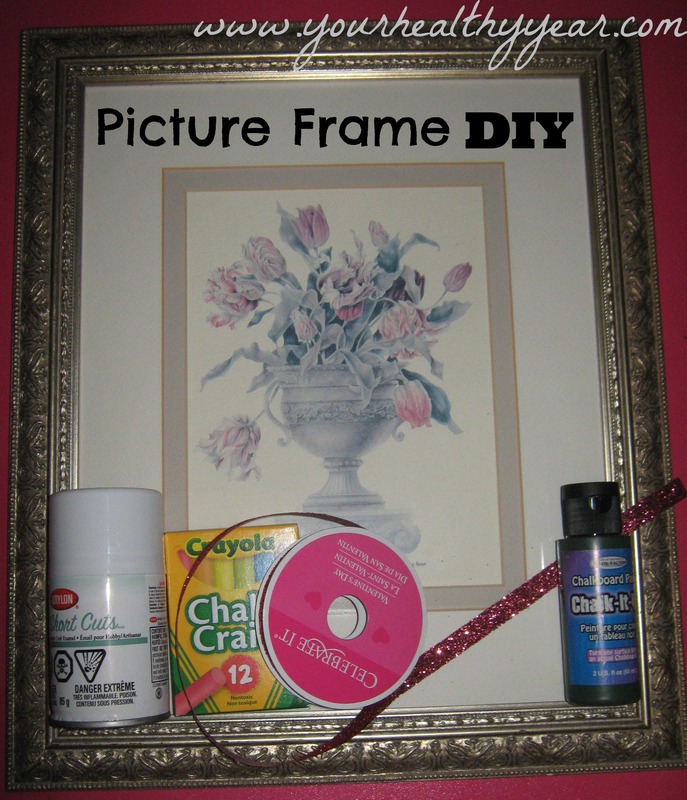 Super easy picture frame diy. Only five materials needed! Earlier this week I found a picture frame at a thrift store. I picked it up and didn’t really know what I wanted to do with it. I’m not really sure why I picked it up in the first place, I am no particularly crafty. I had seen a few cute DIY projects using picture frames, so I guess I wanted to try my hand at creating something with a cute picture frame! When I got home I remembered I had bought some chalkboard paint for cheap. I decided to turn the frame into a chalkboard/dry erase board. I had ribbon already, so all I needed was some spray paint for the frame. This super easy picture frame craft is inexpensive, functional, and cute! Paint and a paint brush if you want to paint the frame. A ribbon for decoration and to separate the dry erase board portion from the chalkboard. The first thing I did was paint the frame. I used spray paint and I did it outside. I only used one coat because I wanted to make sure I didn’t lose any of the detailing on the frame. It worked out fine though because my frame was a light color to begin with. If you really want a bold look, you might want to use multiple coats of paint. Alternatively, this frame would have look really pretty with a super light coat that let the original color of the frame show through. While the frame was drying, I measured the glass and painted a little over half of it with chalkboard paint, let it dry 4 hours, sanded the rough parts, and then applied a second coat. I let the frame, and the second coat of chalkboard paint dry overnight. Finally, the decorations. 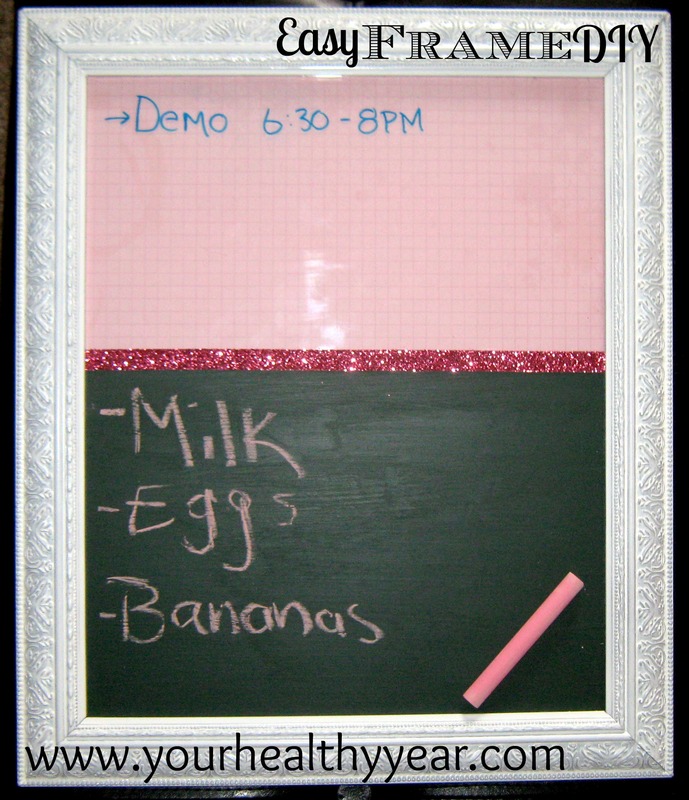 I used a piece of pink scrapbook paper for the background of my dry erase board section, and a piece of glittery pink ribbon to wrap around the glass, separating the dry erase board and chalkboard, and covering up the line of chalkboard paint in the middle of the glass. This picture frame diy was under $20 to make and I can easily change out the scrapbook paper and ribbon if I want to change the colors, or put it in a different room. I’m really happy with the way it turned out and with how easy it was to make. This would make an excellent gift or house warming present too. It really makes a great addition to a kitchen or entry way. It’s the perfect way to help organize your home because you can easily add notes for your family members or reminders for upcoming events. Do you have any simple and cheap diy ideas to share? I would love to hear them! Previous Article← How to Layer your Skin care products the right way. It’s such a good idea to make it half chalkboard and half dry erase. I’ve never thought of that! There are some pretty frames to be found very cheaply, but a coat of paint makes them so much better. Great post! Thanks for the ideas.